Annual Christmas Party - Night to Remember or Night to Forget? a2b Fulfillment held its annual Christmas party for employees and their families this holiday season at Festival Hall in downtown Greensboro, Ga. Good food, plenty of fun and great companionship were shared by over 130 employees and their families and guests. The guest of honor was Dr. Holiday, a trained comedic hypnotist. Several doubtful a2b Fulfillment employees volunteered and were successfully put under Dr. Holiday’s mesmerizing spell. While hypnotized a few of the men had babies, some rode in horse races, while others performed dancing as if they were Michael Jackson. Those folks will probably want to forget the evening; however, the others who watched the show will not soon forget the fun time they had watching their co-workers. The major theme and message of the event was that a2b Fulfillment appreciates the amazing work ethic that the employees strive to attain daily. They are super heroes in the shipping industry and provide a super experience for a2b Fulfillment’s clients. It is because of this work ethic and high standard that we are recognized in the industry as a quality service provider, a great partner to work with and a terrific place to work. To further emphasize the quality of service we provide as a team, President Ayal Latz read several testimonies sent by clients throughout the year. 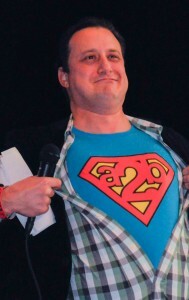 To underscore the Super Hero theme, President Ayal Latz tore off his shirt, revealing the new a2b Shipping Hero t-shirt that was created for the employees in recognition of all their hard work. 2013 was a good year for a2b, which experienced strong growth. Generous bonuses put big smiles on everyone’s faces, as well as receiving their own Shipping Hero t-shirt.